When you pick up a bottle of over-the-counter medication to treat symptoms of an illness in your child, you do so with the belief that anything you can purchase from a pharmacy shelf is probably safe for use. While over-the-counter medications may be marketed to kids, not all of them are actually safe for every child, and some can even cause severe adverse reactions. Despite the rigorous testing involved in the approval process before a drug hits the shelves, there are some medications that simply aren’t safe for young children. Before you reach for a box or a bottle to treat your sick child, make sure that the substance you’re planning to use isn’t one of these dangerous drugs. Aspirin – For adults, aspirin can be a helpful medication. It has fever-reducing and pain-relieving qualities, and can be of assistance in a wide range of situations. For kids under the age of 19, however, aspirin can be the cause of a rare but serious health condition that can be fatal. If your child is suffering from a fever, you may want to treat it with acetaminophen or ibuprofen, but make sure that you’re administering only age-appropriate doses and following the directions carefully. Also, be sure that you look for an “aspirin free” listing on the label of any medicine you purchase over the counter, because some kids’ medications still contain aspirin despite the associated Reye’s Syndrome risk. Cough and Cold Medicines – When your child is suffering, you want to do anything you can to alleviate her pain. 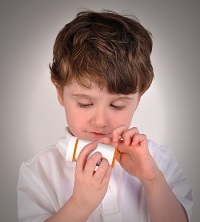 While you may seek to treat the symptoms that are causing her discomfort, it’s important to note that the American Academy of Pediatrics specifically warns against using over-the-counter cough and cold medications for toddlers because their research indicates that they don’t actually have an effect on cold symptoms and can even be harmful if a dose is slightly miscalculated. Rapid heart rate, convulsions, hives and even death can result from overuse of a cold medication, so it’s best to contact a physician or pharmacist if your child has a severe cold or cough, rather than attempting to treat it with OTC drugs. Ipecac – Once a staple of the home medicine cabinet, syrup of ipecac has been used in the past to induce vomiting when poisoning is suspected. The American Academy of Pediatrics does not recommend use of this folk remedy, as vomiting has not been shown to be effective in the treatment of poison ingestion cases and can actually cause more harm. If you do have syrup of ipecac on hand, it’s advised that you throw it out and prevent accidental poisoning by locking up potentially harmful substances instead. Medications Meant for Another Age Group – Giving your child a larger dose of medication intended for infants can be just as dangerous as administering a small dose of one intended for an adult, which means that neither practice is safe or recommended. Medications intended for infants are more highly concentrated than most people realize, making it easy to inadvertently over-dose your child with them. Instead, find an age-appropriate treatment or contact a medical professional for advice. Anti-Nausea Medication – In cases of dehydration caused by excessive vomiting, your child’s doctor may recommend an anti-nausea medication or write a prescription for one. Otherwise, you should never administer them to your child. There are risks involved when your child takes any medication, and episodic vomiting is rarely severe enough to warrant taking that risk with your child’s health. Some of these medications may be recommended by a physician or pediatrician. Generally speaking, this is the only time when it’s safe to administer them to your child. Unless you’re under direct instruction from your child’s primary care physician, it’s just not a good idea to take the risk and administer them to your little one.